Oh I do love a Bank Holiday! Blessed with beautiful sunshine for the best part of the weekend, we headed out on a good few adventures and were reunited with two of our friends, Liz and Will - who had travelled down from the Midlands to see us. 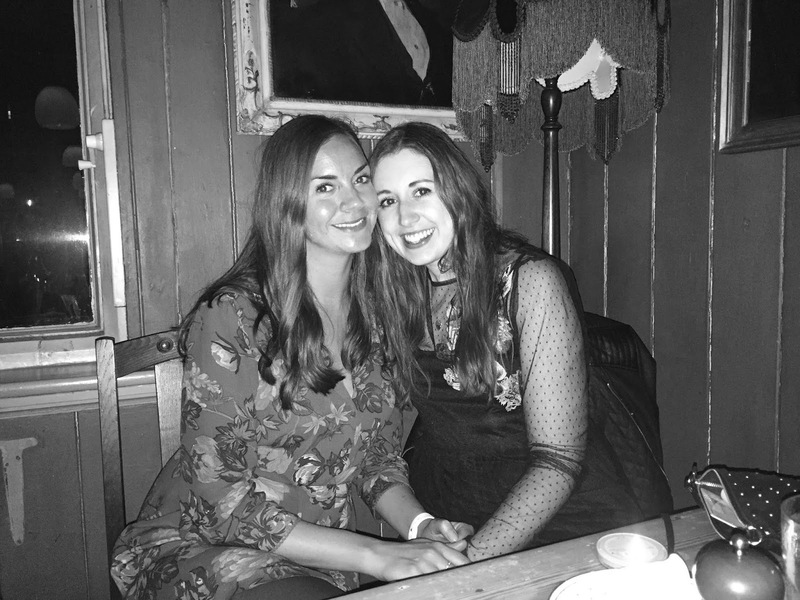 Liz and I have been best friends since senior school and even though living in different parts of the country means we can't see each other as often as we'd like to, when we do get to catch up, it's like we've never been apart. I feel so lucky to have a friendship like that! Of course, a reunion calls for good food, plenty of drinks and the odd blurry photo (it's kind of our tradition!) I definitely felt a little worse for wear the next morning but it was such a fun night. I hardly ever go 'out out' so it was a real giggle. 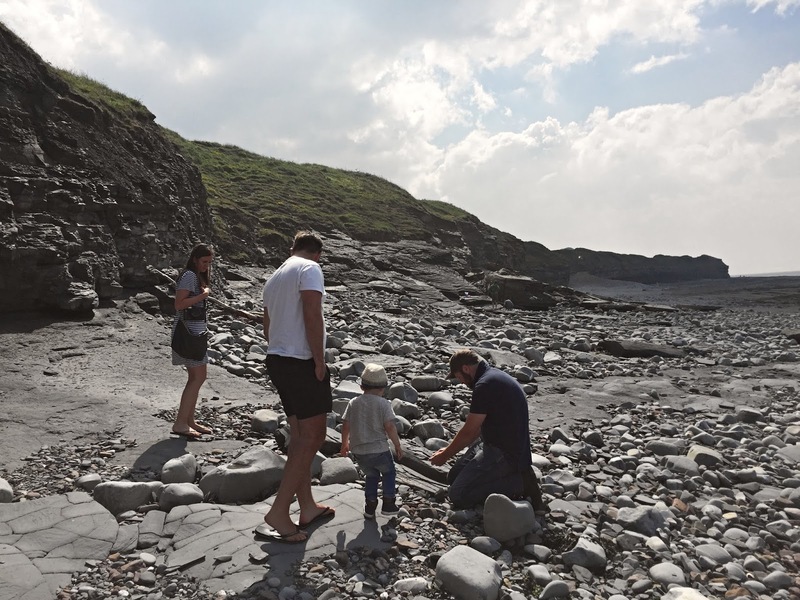 The next day we headed out for a walk in the glorious sunshine and did a little fossil spotting on a local beach. I say 'we' but the men were definitely a lot more into it than us! They were on such a mission and spied some really interesting ones. It was so cute seeing Arthur take an interest in it too. He's becoming quite 'outdoorsy' and I'm going to do my very best to encourage that in him. I took some really beautiful photographs of him on the beach, which like a typical mum, I'll be framing and putting proudly on display! I feel like he's grown up so much recently and love to document every stage as much as I can. Bank holiday Monday started with brunch in the sunshine with Liz and Will, before parting ways. Although I don't like saying goodbye, I know we'll see them again soon and it's so nice to have so much to catch up on when we are reunited. Our afternoon mission was to find the perfect spot to paddle and let's just say, we aced it! 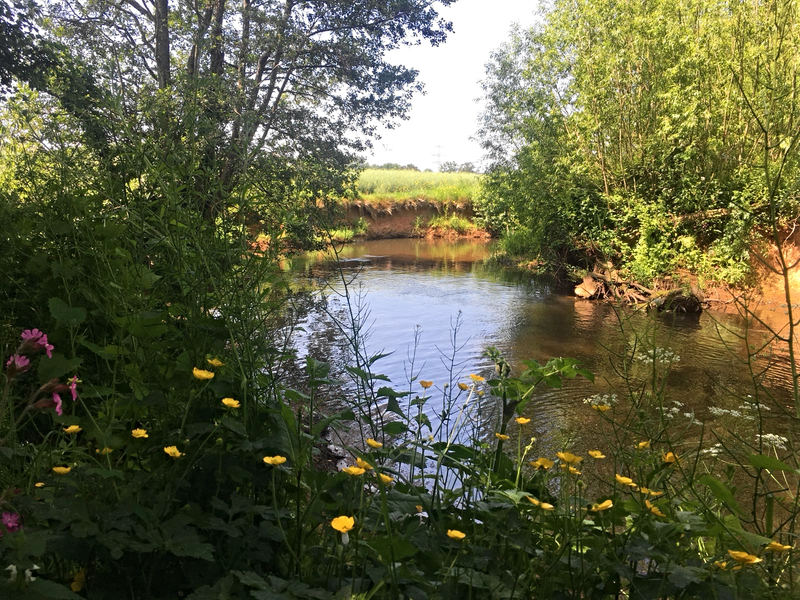 The weather was so warm that we didn't want to do too much, so we went for a drive in the Land Rover (Arthur's new favourite thing - he's even named it 'Pickle') pulled up alongside a local river, followed the footpath and were lucky enough to find a little area, where we could paddle in peace. It was such a beautiful little spot and although the water was fairly cold, it was just what we needed on a day like that. We saw that someone had a Yurt down there and it looked like the most idyllic place to spend a summer's evening. Picture perfect in fact. After having such a wonderful time with friends and family, I definitely had a case of the Bank Holiday Blues this morning but when I thought about all the exciting things we've got to look forward to, I soon shook them off! I have so many reasons to smile right now. Although I'm still yet to find a 'grown up' subscription box I love (beauty boxes just aren't for me) I think there are so many fantastic boxes out there for kids, with one of my latest discoveries being from a wonderful brand called Mud & Bloom. Mud & Bloom was created by business woman and mum-of-two Anja, who was inspired by her love of gardening and being outdoors with her kids. After leaving full time employment, she enrolled on a RHS Horticultural course with the intention of starting a gardening business. 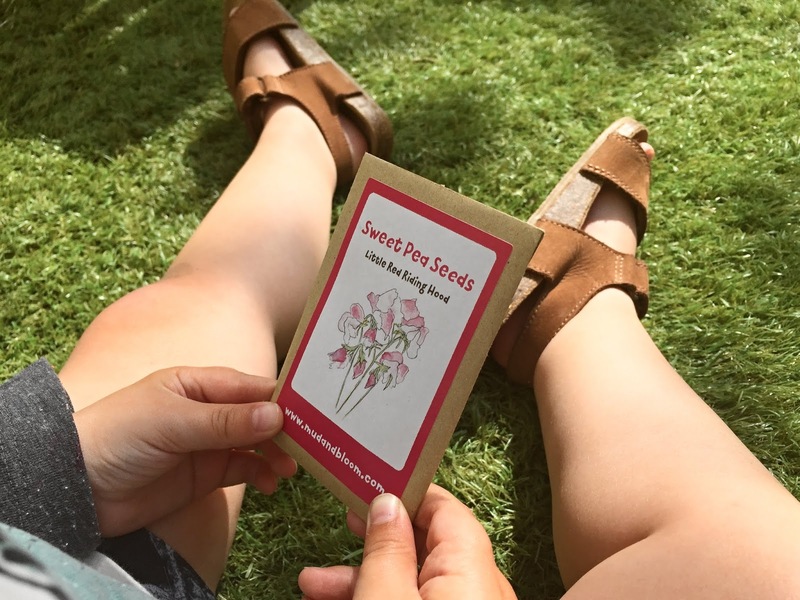 It was then she had the fantastic idea of starting a gardening and nature subscription box for kids and decided to run with it! 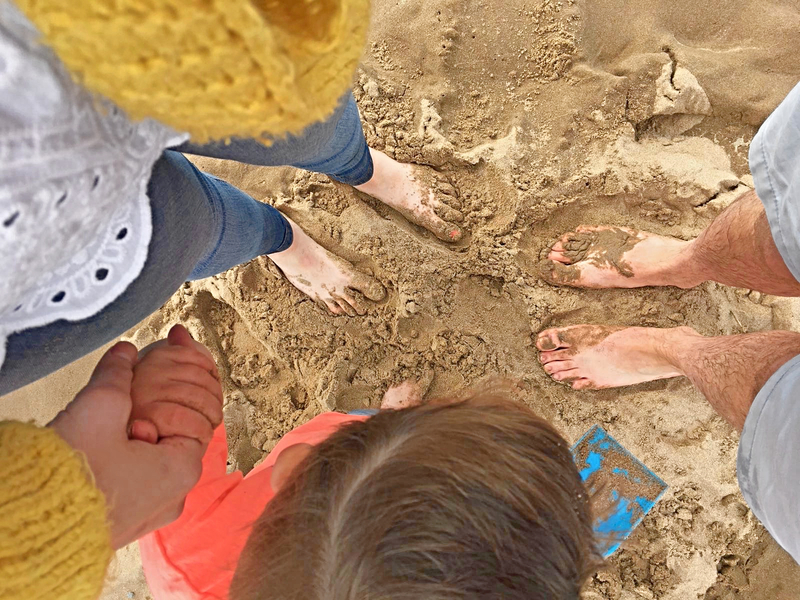 I have a lot of admiration for mums who start and run their own businesses from home - it's not easy - and think Anja has come up with a really great product with Mud & Bloom, for both children and their parents! 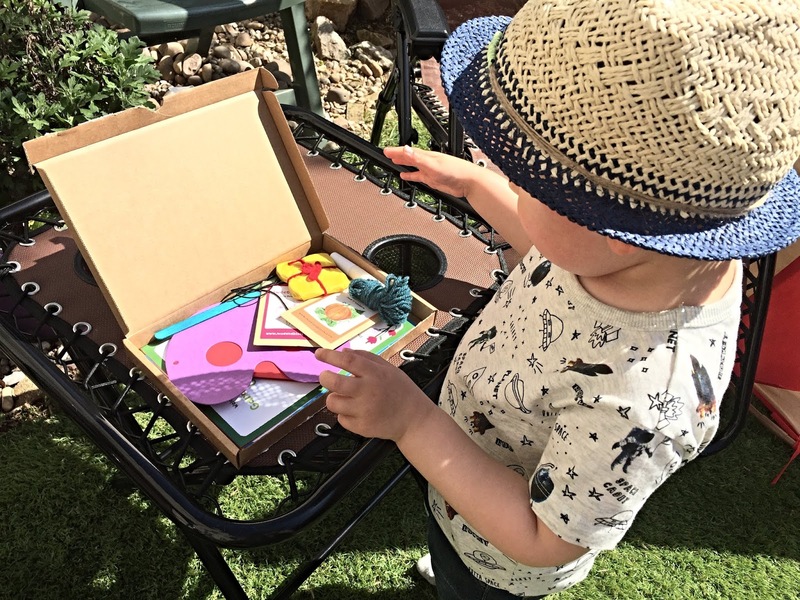 Arthur was lucky enough to be sent the May Mud & Bloom box to have a look at. 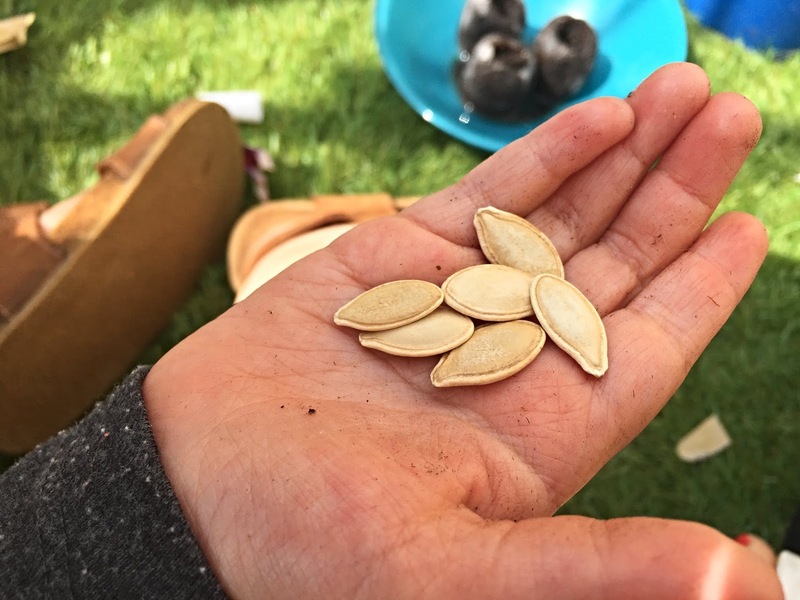 Inside we found a variety of contents including Sweet Pea seeds, Pumpkin seeds, Organic seed pellets and craft items to make a nature loom, crown and mask. There were also cards accompanying the items, with details on how to plant the seeds and create the crafting projects. 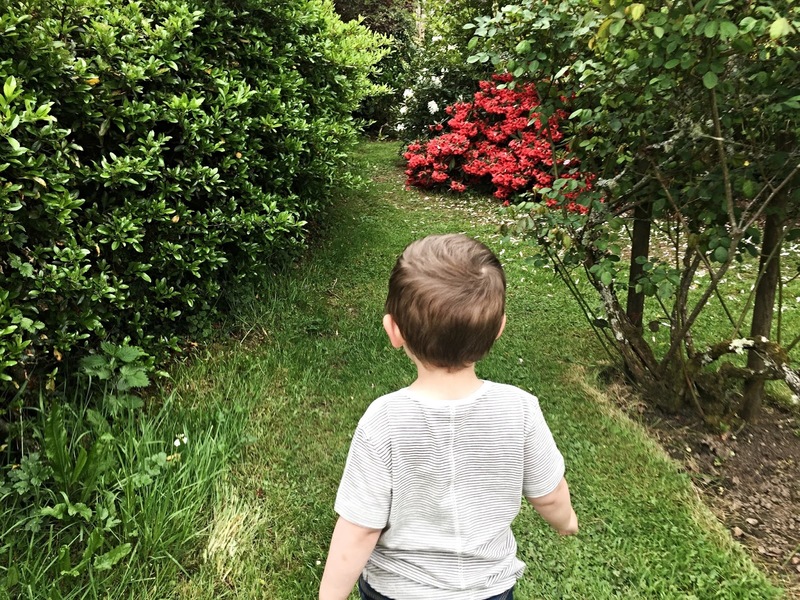 I'm really keen to encourage Arthur to get involved in outdoorsy things like gardening and it's so great to see that it's something he's already taken an interest in. 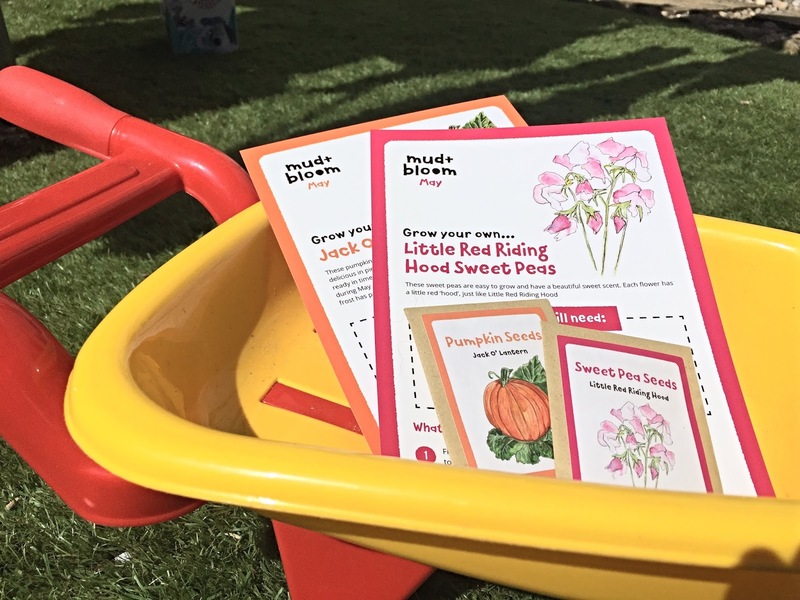 He loves helping his granny water the plants in the garden and has had even more fun planting his sweet pea and pumpkin seeds from the Mud & Bloom box - we can't wait to watch them grow! I think the addition of the crafting projects is also a great idea. Arthur loves crafts and I've got to admit, it's something I really love doing with him. 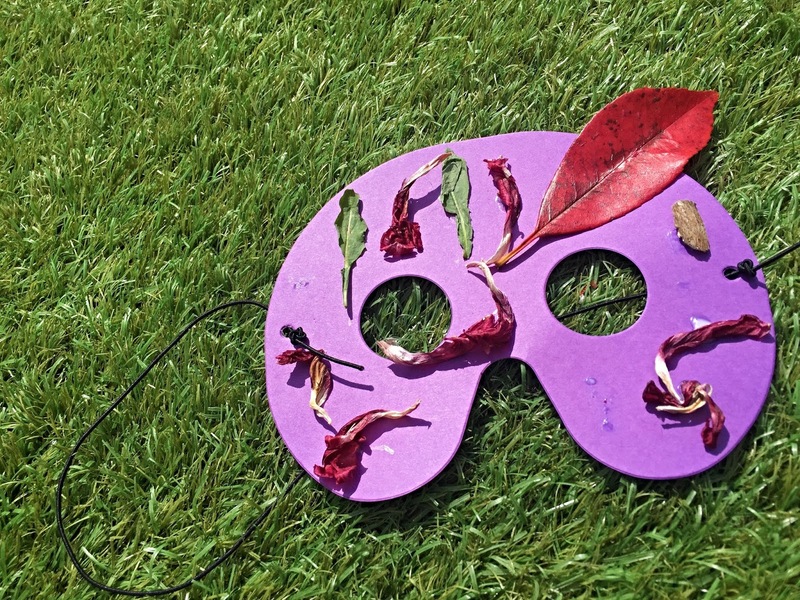 We had a good time together collecting bits from around the garden and park to stick on his Nature Crown and Nature Mask. 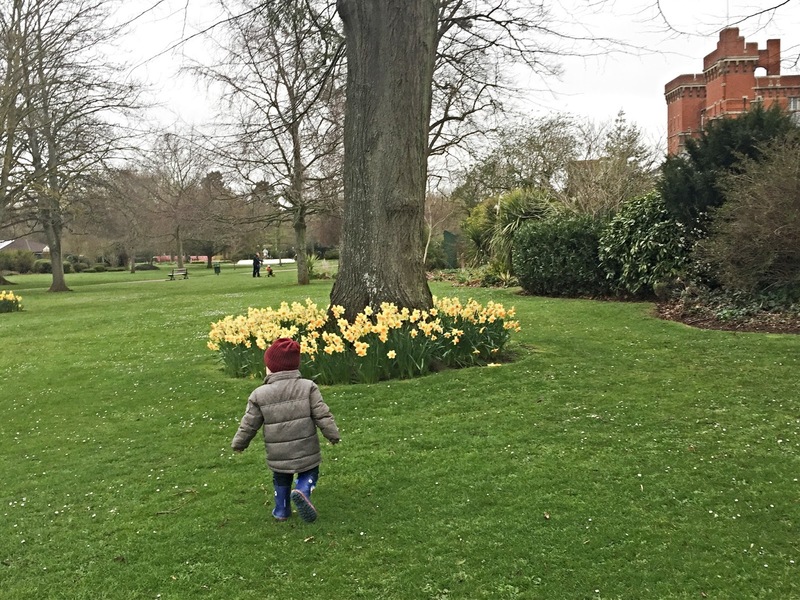 He couldn't wait to try them on and was parading around the garden calling himself 'King Arthur' - it was adorable! 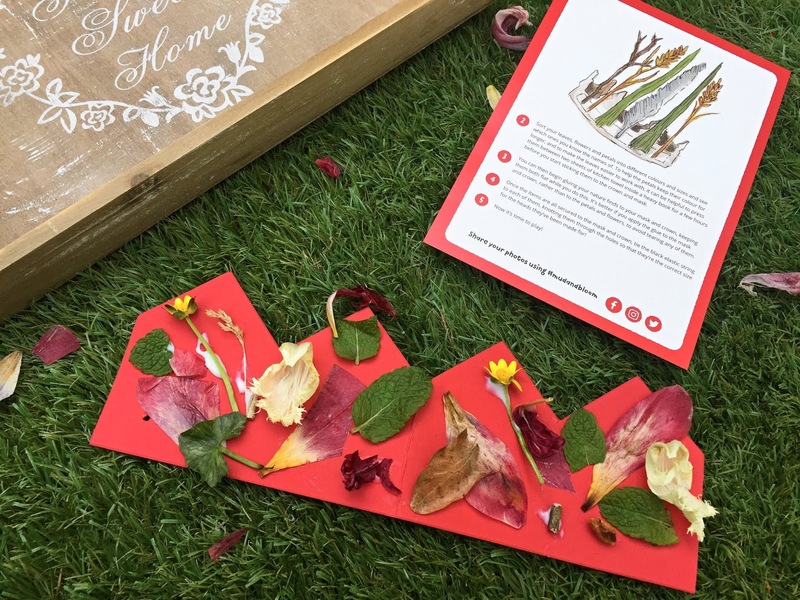 The Mud & Bloom box also includes activity cards for kids to do - with this month's box asking them if they could spot various different spring minibeasts! Arthur loves doing things like this and even though the boxes are aimed at 3-8 year olds, I feel at 2 (and a half) he has still got plenty out of it. 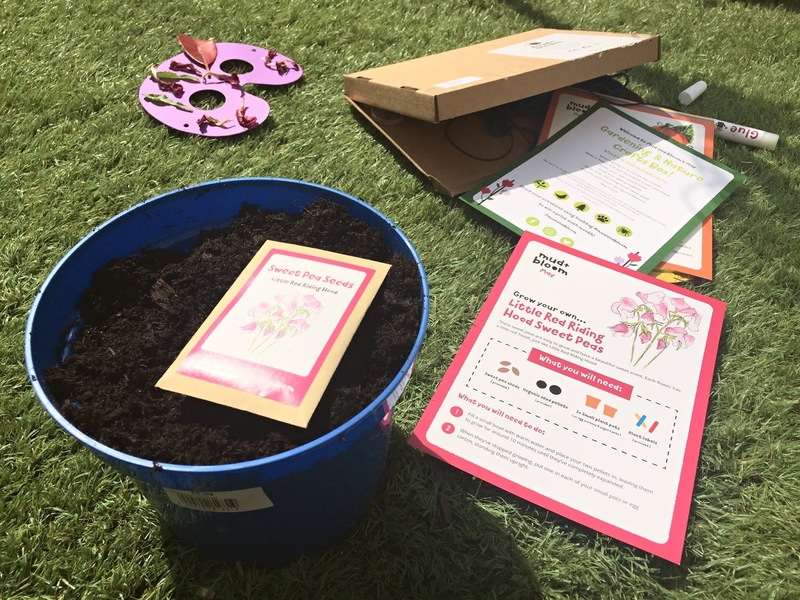 Whilst providing kids with fun activities to do, the Mud & Bloom boxes are also educating them and encouraging them to engage with nature. In a world full of iPads, kids apps and the alike, it's great to offer something like this as an alternative. Something that gets kids outside, having fun! It's also something parents can do with their children, a way of spending quality time together and making happy memories. All in all I think Mud & Bloom subscription boxes for kids are a great idea and provide something a little different to the other offerings out there! Be sure to check out the website for more information on how to subscribe to Mud & Bloom. Father's Day is a little less than a month away, making now the perfect time to start shopping for a heartfelt gift. When it comes to Father's Day there may have been a few occasions where I've 'panic bought' a gift in the past and although I love my Dad dearly, I find him difficult to buy for, so this year I'm trying to be a little more prepared. I will also be treating my other half to a few gifts on behalf of Arthur. He's one of the most important people in his life and their relationship deserves celebrating. 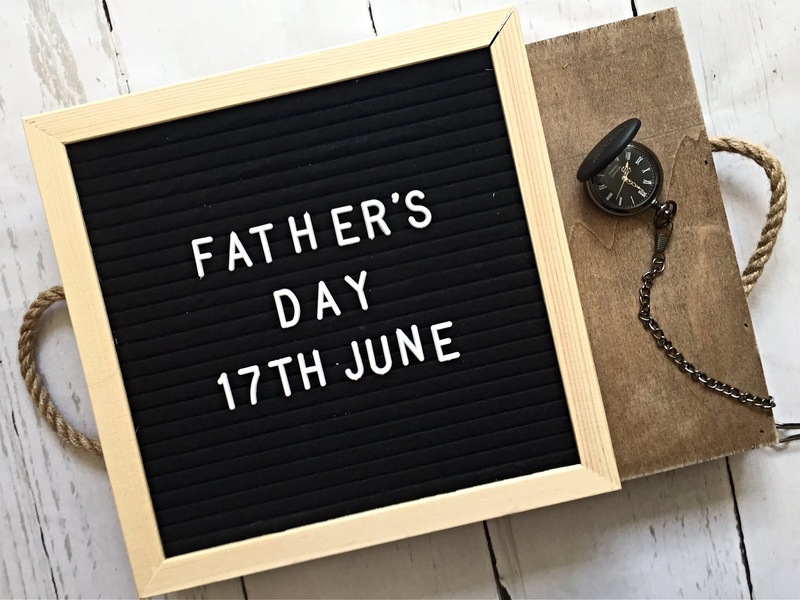 If you too are looking to find a meaningful gift this Father's Day, take a look at my gift guide below for inspiration! If you are looking for a timeless gift your father will love, this Engraved Pocket Watch* (£34.99) will tick all of the boxes. 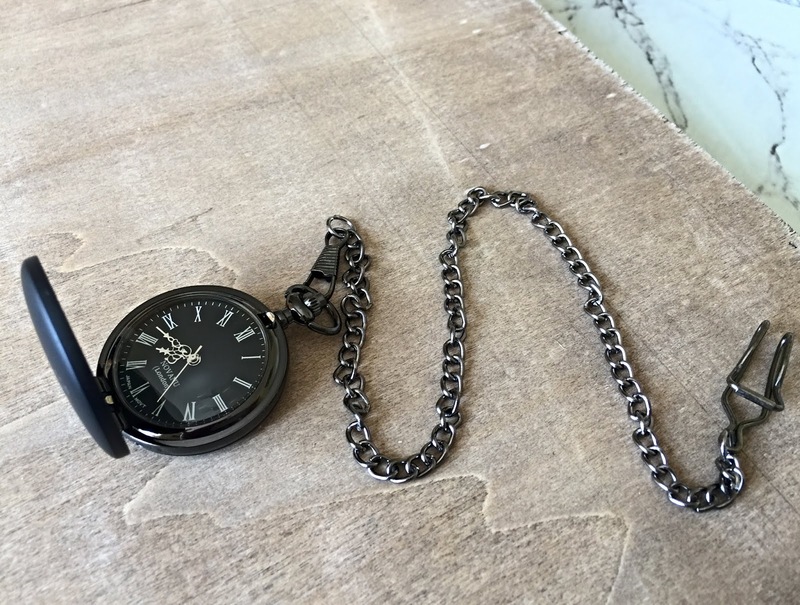 The stylish Quartz pocket watch features a black dial, Roman Numerals and has a gun metal lid, which can be engraved with your personal message. You can choose up to 85 characters, over five lines and will have a choice of font too. 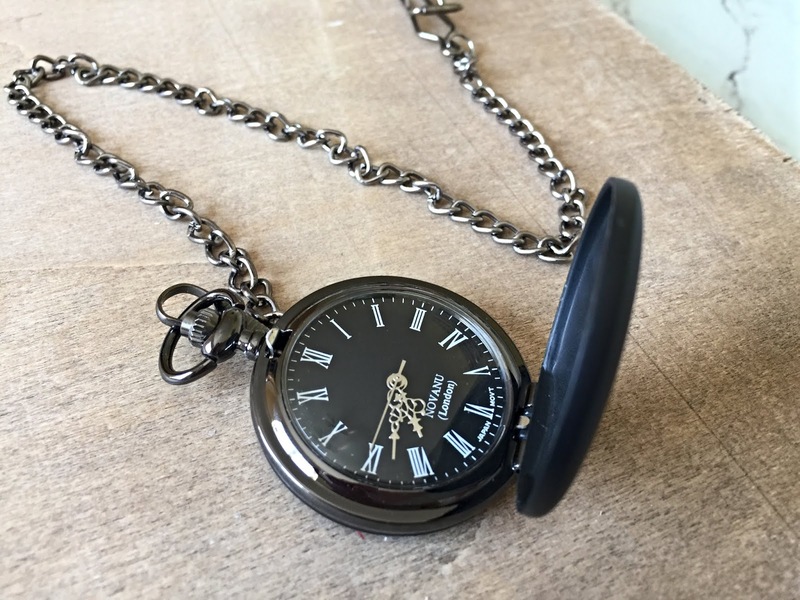 I think it's one of the more unusual Personalised Fathers Day Gifts, as I guess you don't see as many people wearing pocket watches these days but it's quirky and something many men will love; whether they choose to wear it with pride or treasure it as a keepsake in the home. 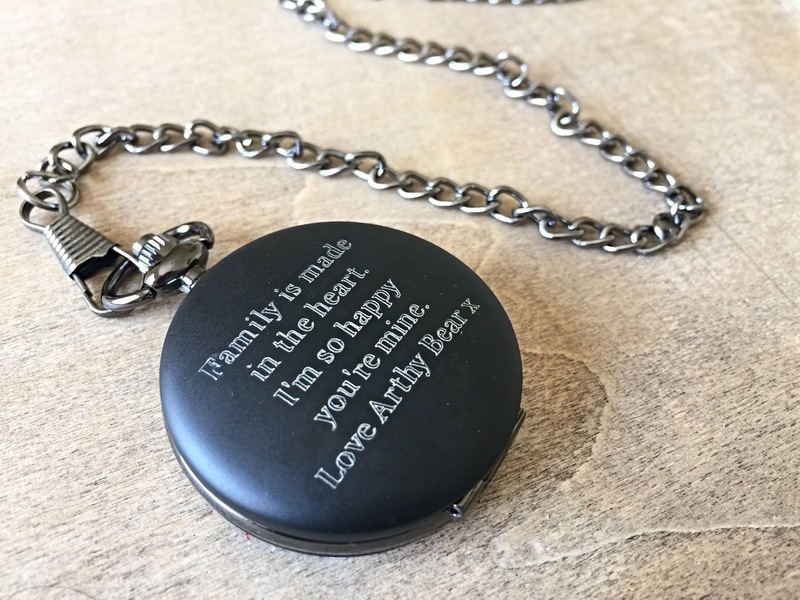 I chose to engrave the pocket watch from GiftsOnline4u with a message about our family bond, as it's something that means a lot to us all and I know my partner will love it. 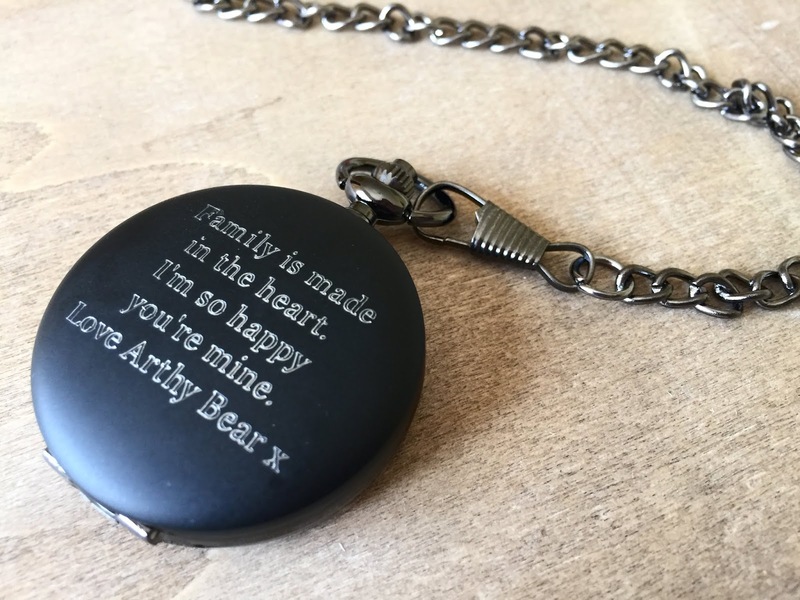 I personalised it with one of the names he calls Arthur, 'Arthy Bear,' as I'm sure, as Arthur gets older, we won't use that nickname as much, so it'll be lovely to have the pocket watch engraved with something that will remind us of it! The pocket watch itself, is made to a high standard and you simply click the button at the top to remove the lid and reveal the stylish watch face. It comes with a matching chain and clip and also arrives in a sleek presentation box for easy gifting. 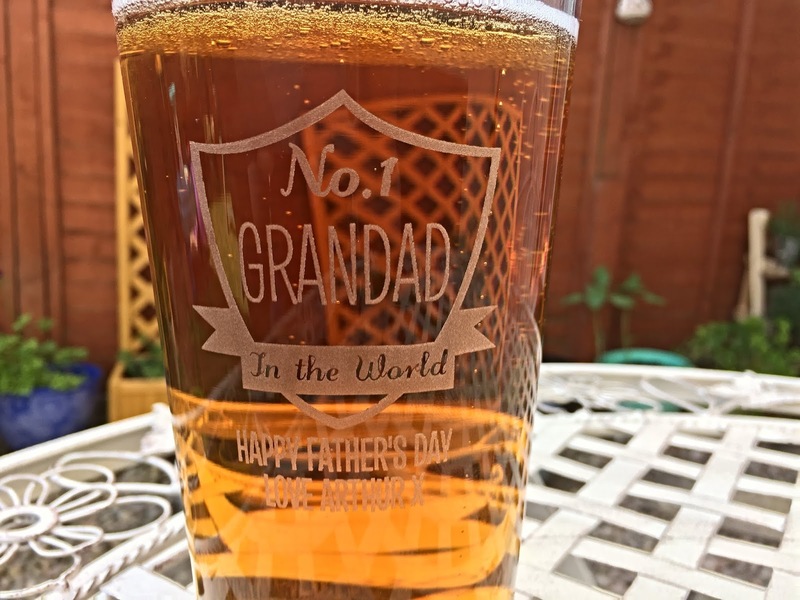 Another lovely Father's Day gift idea is a personalised glass. This Personalised Beer Glass is from Find Me A Gift and is perfect for showing a loved one in your life, just how much you care! You can tailor it to whoever you like and whatever occasion. For Father's Day, I thought I'd personalise this one for Arthur's Grandad (my dad.) He means such a lot to Arthur and I think it's important to not only celebrate Dads on Father's Day but Grandads too! 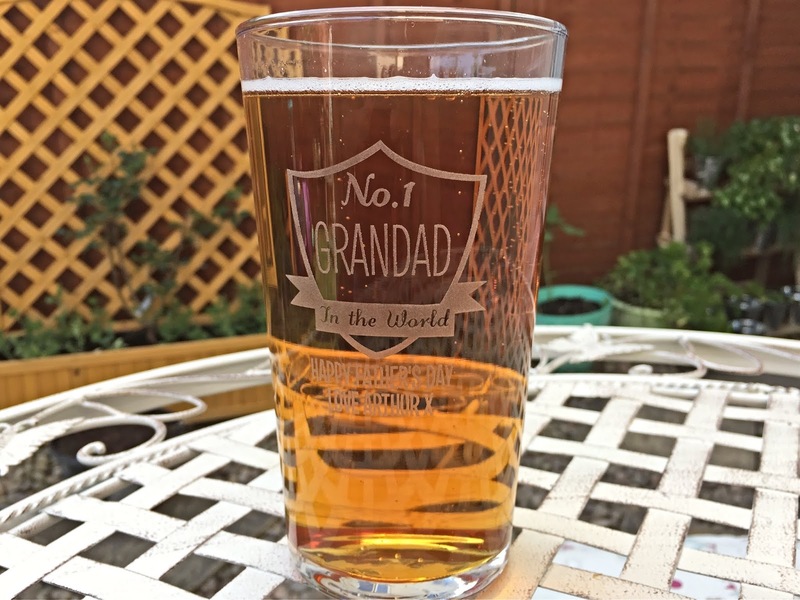 The Personalised No.1 In The World Pint Glass* (£9.99) allows you to choose up to 7 characters for the name or role and a further 20 characters on lines one and two. The quality of the pint glass itself is really good and I'm impressed with the personalisation too. 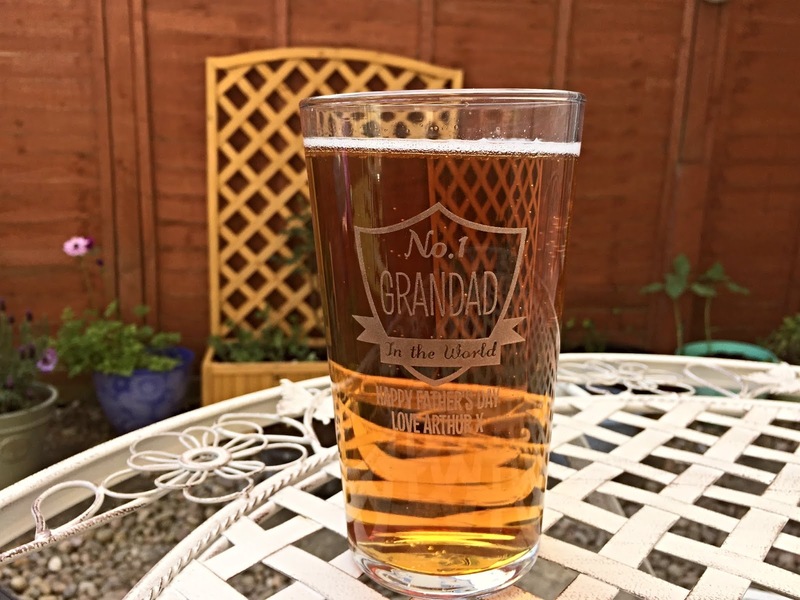 You could add your Dad or Grandad's favourite beer with it, to make the perfect gift for Father's Day. So this next gift isn't your typical Father's Day gift but I absolutely love it! 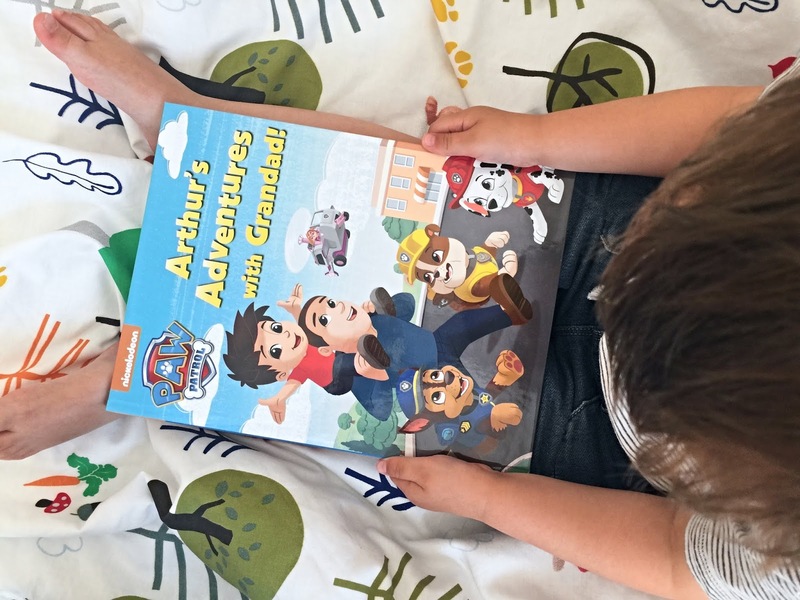 It's actually a Personalised Paw Patrol book*, which can be tailored to a son or daughter and their dad or grandad. It's a brand new addition to the wonderful Penwizard website and available in both softback (£14.99) and hardback (£19.99). 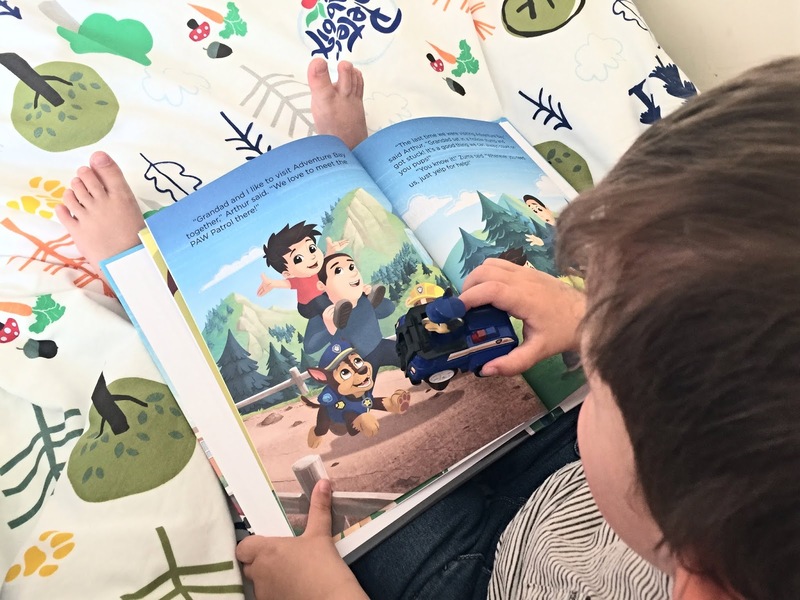 Not only can you personalise the book with you child's name and that of their father figure but you can also alter the characters to look like them too - choosing everything from their skin tone to hair and eye colour. I've actually made my Dad (Arthur's Grandad) look about thirty, which we've all found hilarious. Definitely should have gone for grey hair! 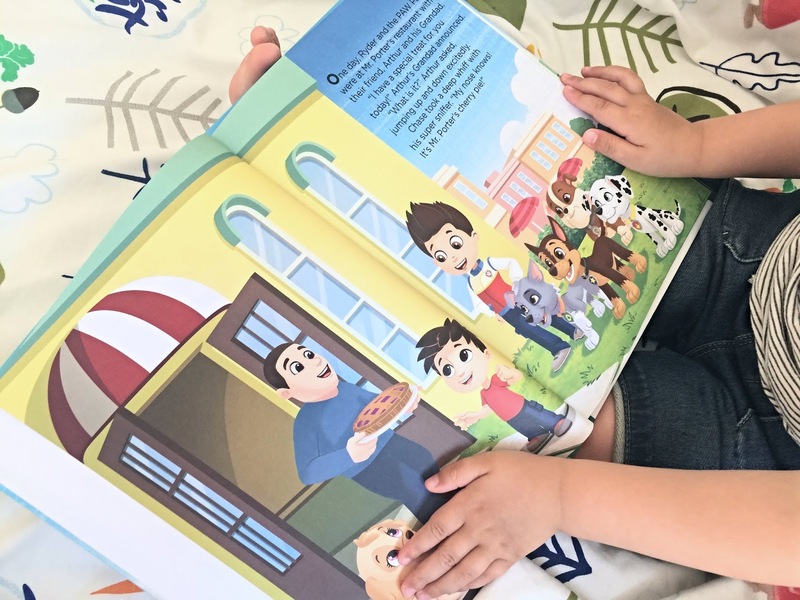 The sentiment of the story itself is so lovely and the fact it places the child and their loved one right in the middle of a Paw Patrol adventure is all the more exciting for little ones. I think it's a lovely gift for Dads and Grandads too though because it's bound to make them feel special and can be something they can do together with their child or grandchild. This will make the perfect gift for Father's Day and Penwizard have been kind enough to offer a 20% discount on orders, using the code PAW20. 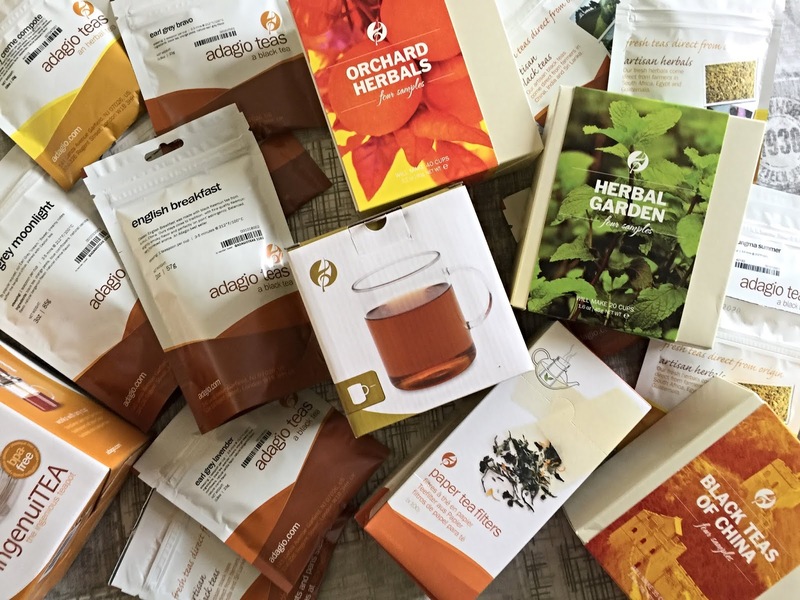 If your Dad or Grandad is more of a tea drinker, then head on over to Adagio Tea for a look at their extensive collection of flavoured teas. From traditional breakfast teas to green tea, black tea and fruity teas, there's bound to be a blend that takes your fancy. Having got to try a few of the loose leaf teas from Adagio* I can really recommend the Orchard Herbals sampler (£7.00). The Wild Strawberry tea in particular is a real treat. Add a product from their tea ware collection to complete your Father's Day gift! I can highly recommend the IngenuiTea* (£18.00) which is great for brewing loose leaf tea. You simply add the tea and water, let it steep and then place the teapot on top of your cup and press down to pour the tea without getting any leaves in it - it's genius! A jigsaw from Wentworth Wooden Puzzles is a rather unique gift that many Fathers and Grandfathers will love! 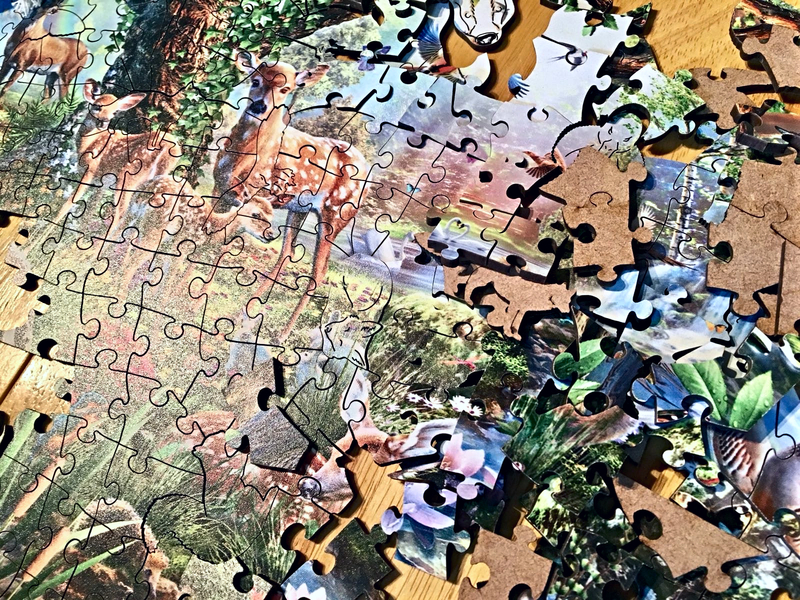 We were lucky enough to receive the Woodland Creatures Puzzle* (from £27.00) from their spring collection a couple of months back (full review here) and really enjoyed piecing it together as a family. Wentworth Puzzles actually offer Personal Photo Puzzles, which I think would make a fantastic gift idea for Father's Day. You can simply select a photo that your Dad will love (perhaps one of you together or your family) and have it turned into a completely unique wooden puzzle. They also have options to add special messages, which can add a lovely, meaningful finishing touch to your Father's Day jigsaw. 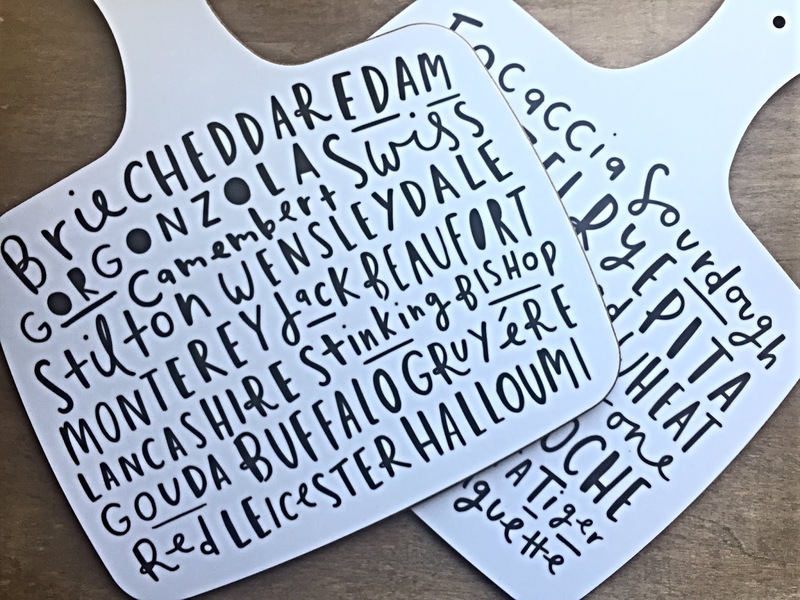 If you're looking for more of a 'foody' gift this Father's Day, these Bread and Cheese boards from Old English Company will make a lovely choice. I love their stylish design and the fact they feature the names of all different breads and cheese. They're a lovely size and would look great combined with a hamper of some of your Dad's favourite foods. Old English Company also have a selection of prints, which could also make great Father's Day gifts, as well as a range of stylish Father's Day cards. Shaving products and toiletries are always a failsafe gift for Father's Day but if you are looking for ones with a little more style and charm, I point you in the direction of the English Shaving Company. They offer a fantastic selection of male grooming products; from razors and shaving sets to fragrances, soaps and creams. I'm actually going to be reviewing one of their Lady's DE Razors on the blog soon so be sure to look out for that. 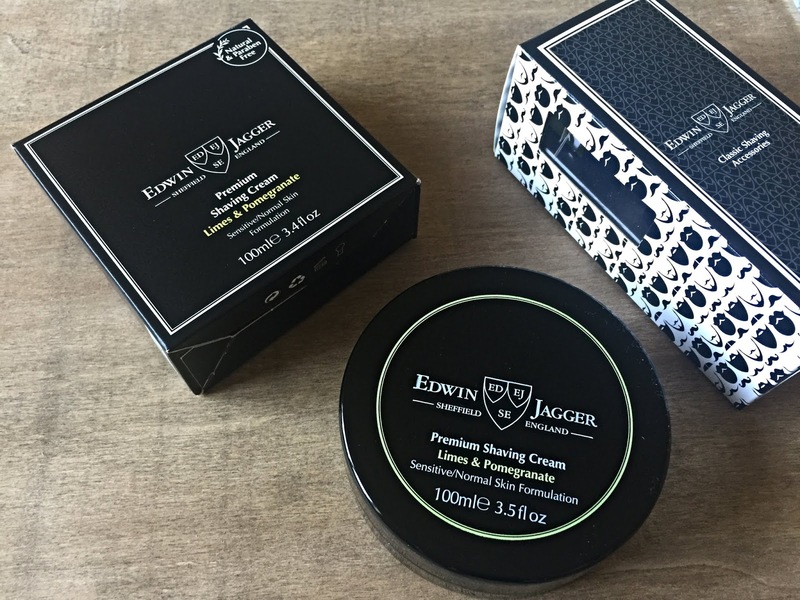 They've also kindly sent over the Edwin Jagger Limes & Pomegranate Shaving Cream* (£14.00), which smells amazing and would make a wonderful gift in itself! 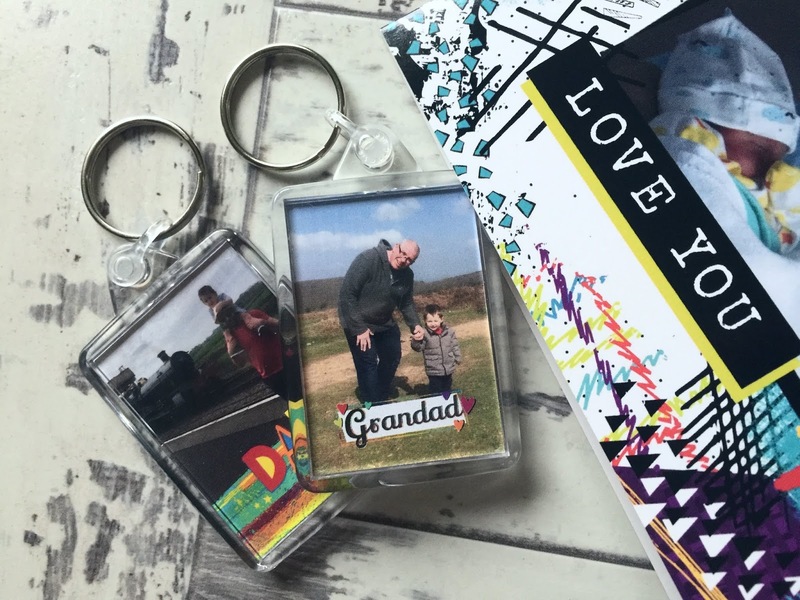 If you're looking for the perfect finishing touch to your father's day gift or perhaps a little token gift instead, a personalised Father's Day keyring* from Funky Pigeon will make a wonderful choice. At £3.99, they're extremely affordable and what's great is that you can add a photo of you and your dad or grandad for an extra special touch! There's a few different designs to choose from, so be sure to head on over to the Funky Pigeon website to see them for yourself. Funky Pigeon also have a fantastic range of Father's Day cards. I've actually purchased cards for my other half and my dad (on behalf of Arthur) from there. Again, I love that you can upload photos and completely personalise them. I highly recommend checking them out if you are looking to design your own Father's Day card. 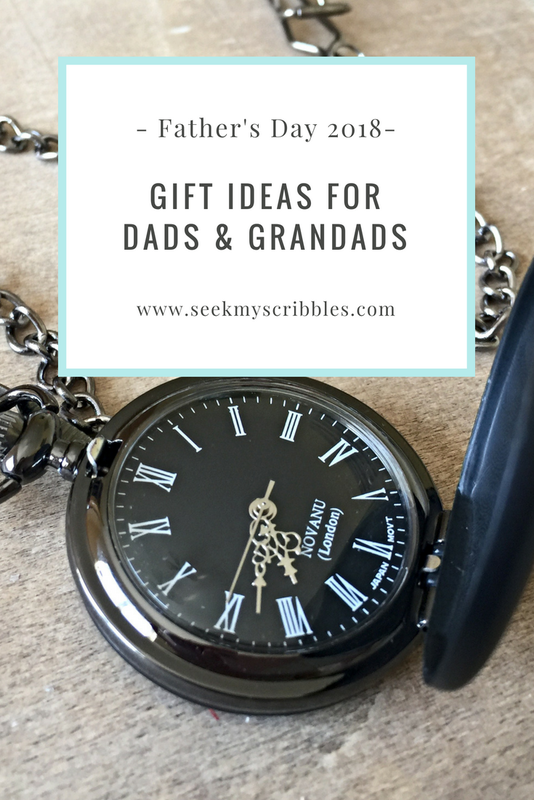 I really hope my Father's Day Gift Guide has helped you find some lovely present ideas or at the very least given you some inspiration for things to buy your Dad or Grandad. *PR Items. All opinions are my own. Last weekend, we spent Saturday afternoon in one of my favourite places, Woolacombe. The seaside resort, on the coast of North Devon, is somewhere we've holidayed many times as a family and it's a place I never grow tired of. The beach is stunning, the atmosphere relaxed and it's a fantastic place to visit with children. 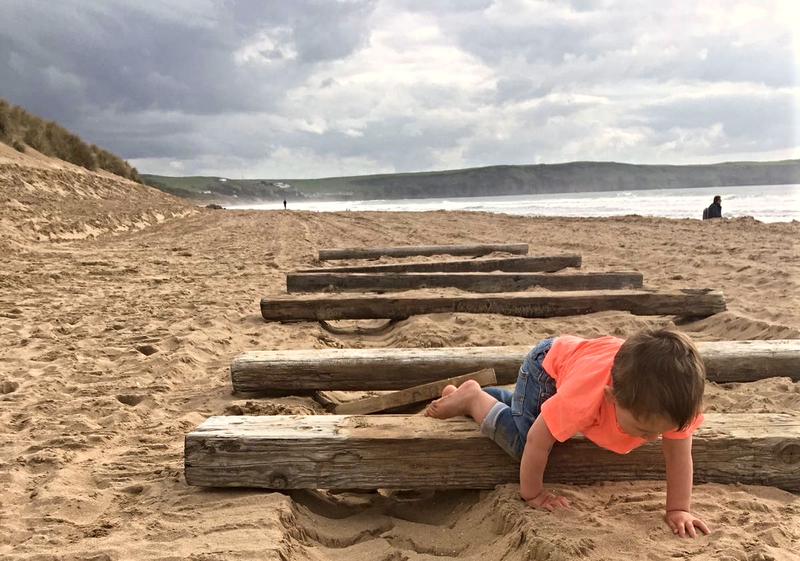 The last time I took Arthur to Woolacombe, he was around 11 months old, still a baby and not yet walking. 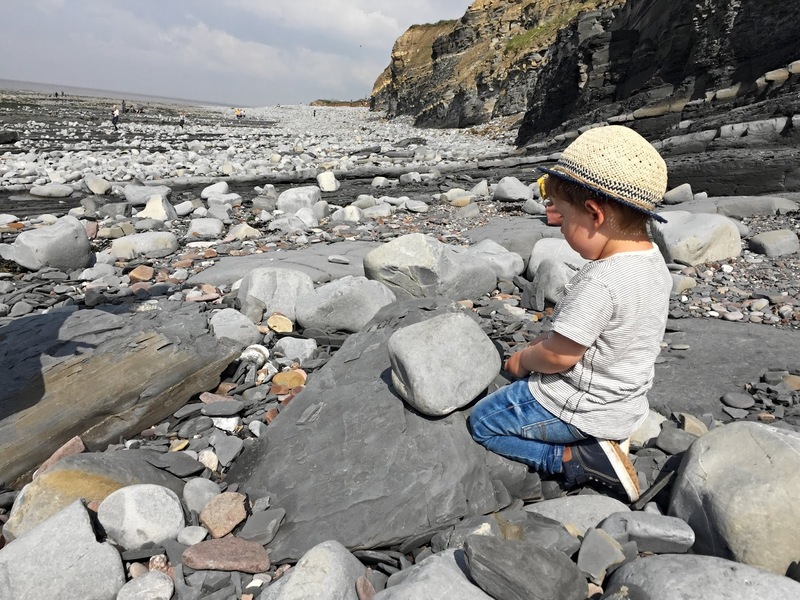 It's so lovely to compare the pictures I took of him then, to the pictures I have of him this time round, where he's running into the sea, building sandcastles and being the brave, adventurous, little boy he is. 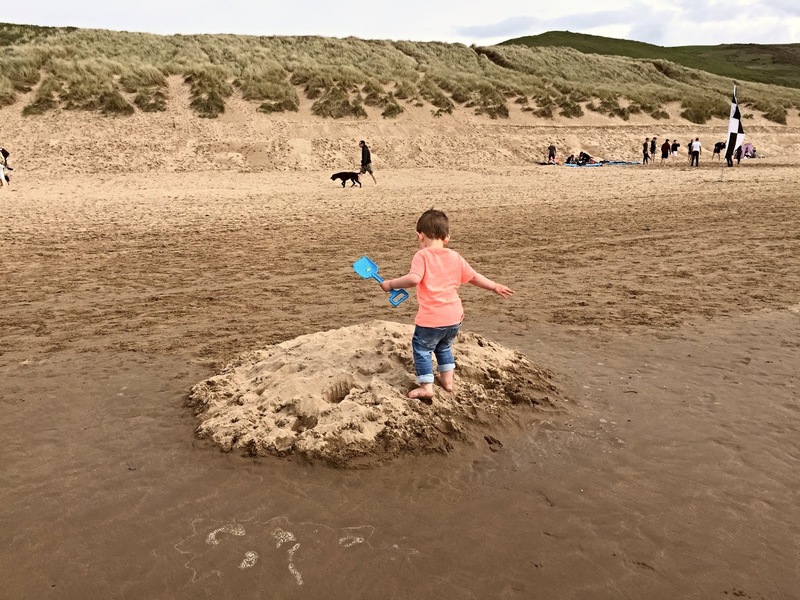 The sheer delight on his face of being chased by the waves back onto the sand and the fun he had crushing the sandcastles we made, was everything. Picture perfect moments. Another thing we love about Woolacombe is that it's dog-friendly. We visited the Red Barn for a late lunch because we knew that dogs were allowed both inside and outside. We chose to sit outside to make the most of the sunshine and were lucky to find a table in the corner - it's a venue that's always packed on a sunny day! After a bite to eat, we headed onto the beach, which also has a dog-friendly section. My mum and dad were able to take Oby for a long walk along the beach, while me, my partner and Arthur played in the sea and built sandcastles. As usual, we got a little snap happy, as you'll have seen if you follow my Instagram (@megan_jane03) but with such lovely weather and a beautiful setting, who wouldn't make the most of the photo opportunities?! There was a funny moment when I really wanted to get a nice family photo of us but Arthur had other ideas and I ended up having to chase him up the sand dunes a couple of times (the boy is quick!) - at least I worked off my burger from lunch though! It really was a wonderful afternoon and has added to my bank of memories in Woolacombe. I imagine we'll be visiting again at some point this summer. 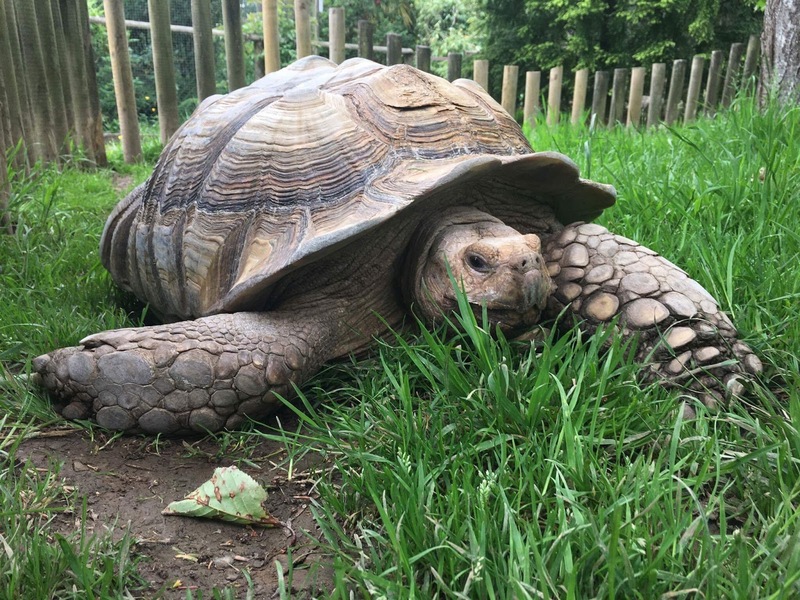 I'd also love to explore Combe Martin and take Arthur to the dinosaur park there too! 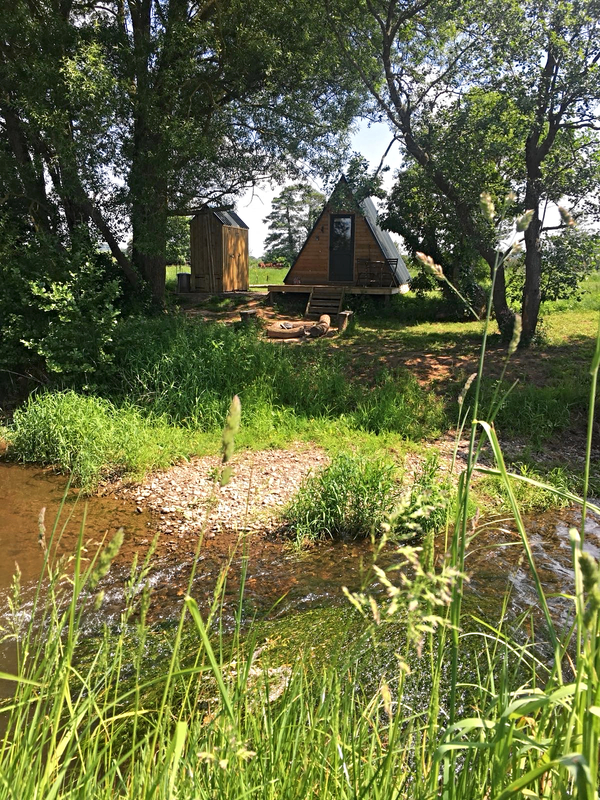 North Devon is such a lovely place and being only an hour or so's drive away (as opposed to the nearly four hours it used to take us) it's the perfect excuse to visit more often! 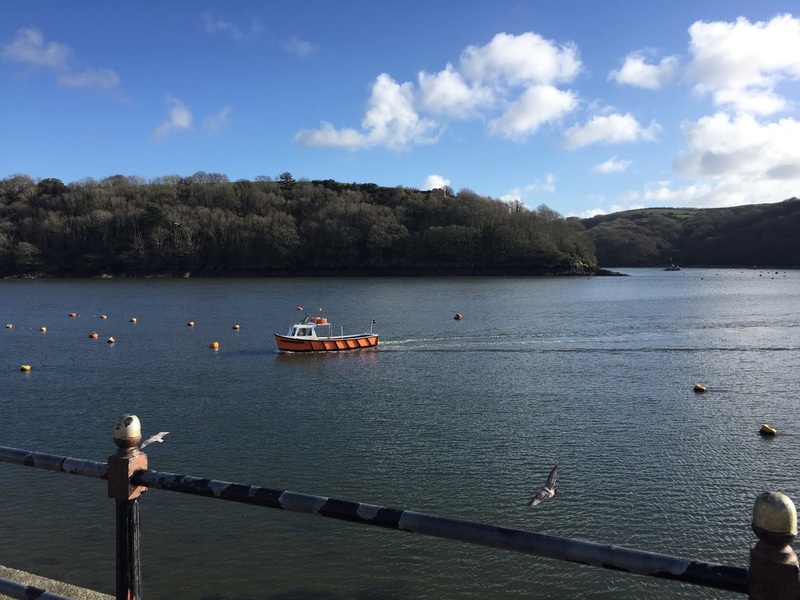 Have you holidayed in North Devon? Where are your favourite places to visit? Over the years I've grown my hair long, cut my hair short, had a full fringe, had a side fringe, coloured it blonde, coloured it red, coloured it purple...the list goes on! Now at the age of twenty seven, I've decided that all I really want is nice, long hair that's in a good condition. Before I had my son, Arthur, my hair always grew super fast but it's funny, since then, it's never been quite the same. I don't know if it's related to the postpartum hair loss I experienced or just because I'm a little older now but it's definitely not as fast-growing as it used to be. I don't tend to use a lot of products on my hair these days but I know that in order to keep growing it longer, I need to take the necessary steps to keep it in a good condition. Something I recommend is actually having regular trims. Cutting your hair may sound counterproductive but it actually helps to keep the hair healthy and help it grow. Below you'll find some more tips on how to keep your hair (in particular the roots) healthy and encourage good hair growth. When it comes to hair care, your roots and your scalp are the most important things. A lot of people take steps to look after their scalp but they neglect the roots. If you aren’t taking good care of your roots you’ll never get strong, healthy hair. Root care is especially important if you want to grow your hair long. If you’re struggling to get your hair looking healthy and you think you’ve tried everything, it might be because you aren’t paying enough attention to your roots. Follow these simple root care tips and you’ll see a big difference in no time. We’ve already talked about the scalp but it’s worth mentioning again. The first step to healthy roots is a healthy, clean scalp. If you aren’t keeping it clean enough, you’ll get a build up of bacteria and dead skin cells which will affect your roots and in some cases, could stop your hair from growing properly. The best products to use on your scalp are sulphate free shampoos but you can use some natural remedies as well. 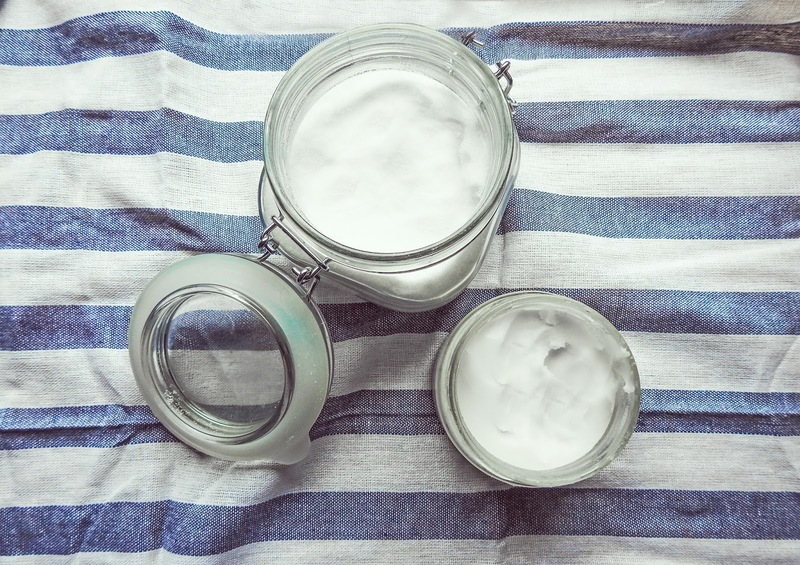 It might sound a bit strange but a mixture of baking soda, vinegar and warm water is a great scalp cleanser, when used regularly. Now that you’ve got your scalp under control, it’s time to start taking more steps to keep your roots healthy. Your hair is very delicate, especially around the roots, so you need to be careful what you’re putting on there. Sulphate free shampoos are good but you need to be careful with other styling products like mousses. If you’ve got fine hair (like me) you’re probably in a constant battle with your hair trying to get some volume into it. If you use root lifter for fine hair you’ll get more volume in your hair and take care of your roots at the same time. Keratin shampoo is another great product which helps to repair damaged roots and keep the hair healthy. Overall, you should try to avoid using too many products that might strip the natural oils from your hair and dry it out. Only use products when necessary and try to use ones with as many natural ingredients as possible. Increased blood flow to your scalp brings more nutrients to the surface and encourages healthy roots. You can help this along by giving yourself a hot oil massage using coconut oil. Warm it gently and massage it into the roots and the scalp. The coconut oil itself is also good for hair health so this is a great treatment. People don’t often think about diet when they’re trying to make their roots healthier but what you eat can have a big impact. You need a balanced diet with a good amount of protein because that encourages hair growth. Vitamins and nutrients are equally as important so make sure you’re eating a good diet of fresh fruit and vegetables, as well as lots of healthy protein sources. Milk, fish, eggs and green vegetables are particularly good for your roots so get plenty in your meals wherever you can. Moisture is important as well and if you’re dehydrated, your scalp and roots will start to dry out. That’s why it’s important to try and drink 7 or 8 glasses of water a day (it's easier said than done) and perhaps more when the weather is hot. Even though upping your water intake may require a little effort; adding that moisture to the cells in your scalp and roots will make them more efficient and improve hair growth. You can’t avoid brushing your hair completely because you need to get rid of knots and tangles but if you go overboard, you could be doing some serious damage to your roots. Every time you brush your hair, you’re pulling at the roots so you want to avoid it as much as possible. Over brushing can lead to increased hair loss and reduced growth because you’ve weakened the roots. Brushing it while it’s wet is good because the comb glides through a lot easier and you don’t need to tug it so hard but you should still take extra care and don’t rush it. Scratching your head is something that you do without even realising it but you should be more aware of it. If you’re constantly scratching at your scalp it'll have the same effect as over brushing, so just be mindful of it. Taking good care of your roots is the most important thing if you want long healthy hair. Once you get your roots in good condition, everything else will follow naturally! There's nothing like a good face mask to make you feel relaxed and pampered. I like to do one every now and then, when I get a little 'me time' in the evenings. My current favourite is the Mineral & Ginger Warming Massage Clay Mask (isn't that a mouthful) from The Body Shop. It's a real treat for the skin and for me, ticks all of the boxes a mask should. The first thing I like about this mask is it's squeezey tube packaging. There's no messing around trying to open a sachet or having to dip your fingers into a pot. 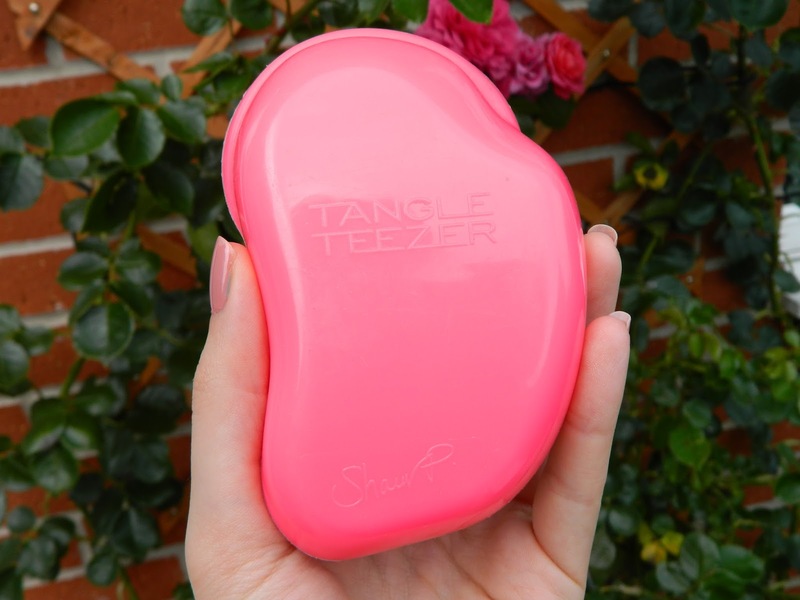 You can squeeze out what you need and apply it within seconds. Upon application, the Mineral & Ginger mask immediately starts to warm the skin. I love this feeling, as it opens up your pores and stars to work it's magic. The mask is scented but very lightly. It's not too gingery and is very pleasant. Unlike other clay masks, this one from The Body Shop does not dry on the skin. It remains a thick cream like texture, which won't be everyone's cup of tea but actually, I prefer it. I find masks that harden on the skin quite uncomfortable and peel-off masks are such a pain to get off. The removal of this mask is really easy - wash it off and you're done. I've seen some reviews that says it leaves white residue on their face but I think this just means you need to wash it off a little more and pat your face dry afterwards! Although it's hard to pinpoint results from specific products, as I use a few different skincare products each day, I think the Mineral & Ginger mask helps to draw out impurities from my pores and leaves my skin feeling a little fresher. I've also noticed (and looking at other reviews I'm not the only one) that it leaves my skin looking more radiant and glowing. What more could you want from a face mask? At £11.00 it's reasonably priced, considering the amount of product you get and that a little goes a long way! 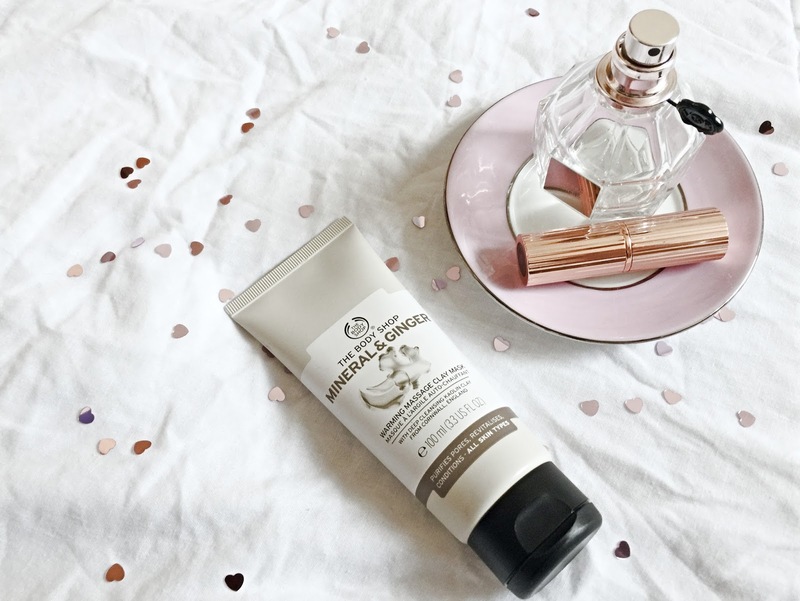 The Body Shop have usually got some sort of discount or deal going on too, so if you plan on refreshing your skincare routine, there's often a chance to pick up their products a little cheaper anyway! 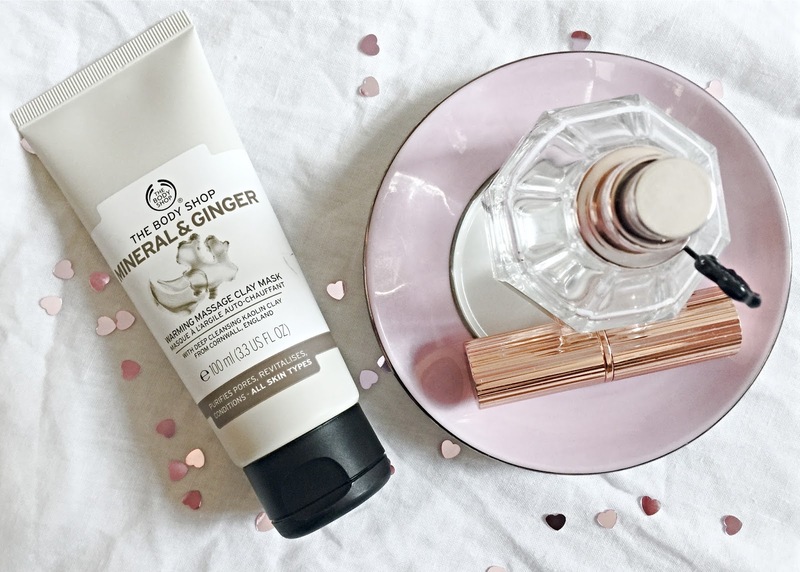 Have you tried this mask from The Body Shop? Sunday has long been acknowledged as the day of rest, even by those who aren’t of the Christian faith. In the UK it’s the day of lie ins, long, lazy mornings, indulgent Sunday roasts, family and good times… Until the Sunday evening ennui sets in and the working week looms over us, casting a shadow on the rest of the day’s enjoyment. Solving puzzles is a fun and engaging activity for us to do on our own but it’s even more enjoyable to do as a family. Find an Escape Room near you - they’ve sprung up all around the country so one won’t be hard to find, and choose a scenario from which to escape. You will have a limited time to escape from the room and you will need to work together to solve riddles and puzzles to escape before your time limit elapses. This may not be appropriate for young kids but for older kids who love a challenge it doesn't get much more fun and immersive than this. Plus, it’s a great learning experience and a fun opportunity for the whole family to use their creative problem solving and teamwork skills. Follow it up with a leisurely lunch somewhere fun and you have the makings of a perfect family day out. Lots of us want to get out and engage in more physical activities, but modern living can be a real impediment to this. Our physical exercise tends to get limited to trips to the gym before work and the short walk to the car before our daily commute begins. Why not take the whole family up into the trees for some fun, gravity defying (but perfectly safe) frolicking like our primordial ancestors. You’ll find Go Ape sites dotted around the country and while this is a paid activity it’s surprisingly reasonable considering what you get for your money. Although if finding the cash is an issue don’t miss out on this article on turning your clutter into cash. Another fun outdoor activity for the whole family that needn’t cost a thing is a hike on a nature trail. This can be as interactive as you like. 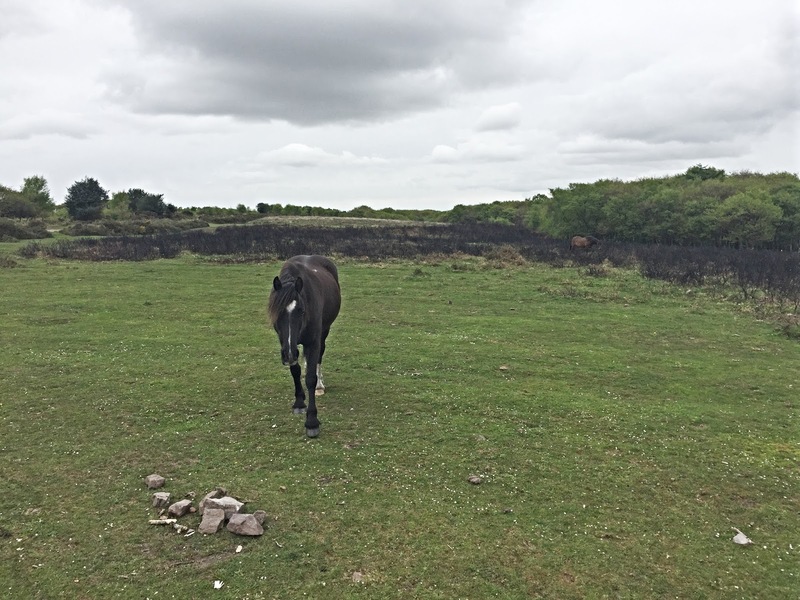 It could simply be a fun excursion amongst beautiful surroundings or it could be a fun and interactive experience for young children, marking off examples of local plant and wildlife as they encounter them. As a family, we like to spend as much of our weekends outdoors as possible. 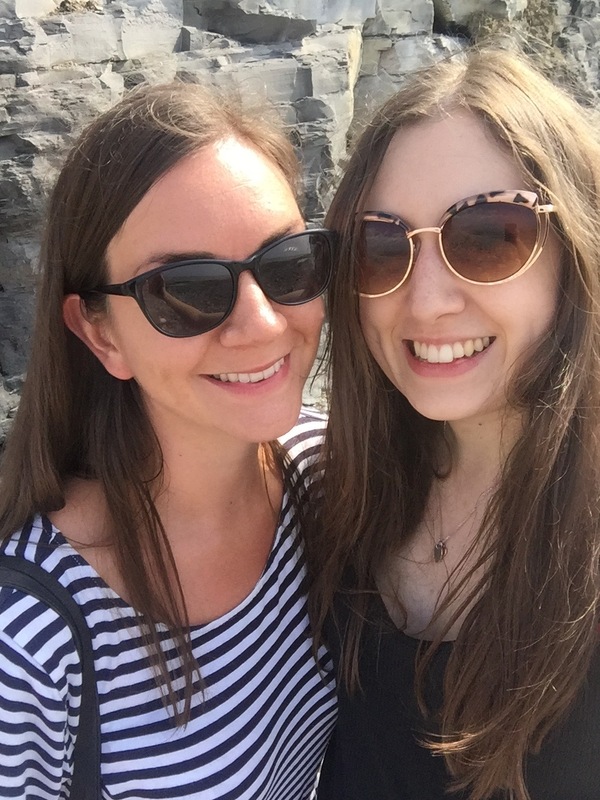 We love going on walks, exploring new places and being local tourists. 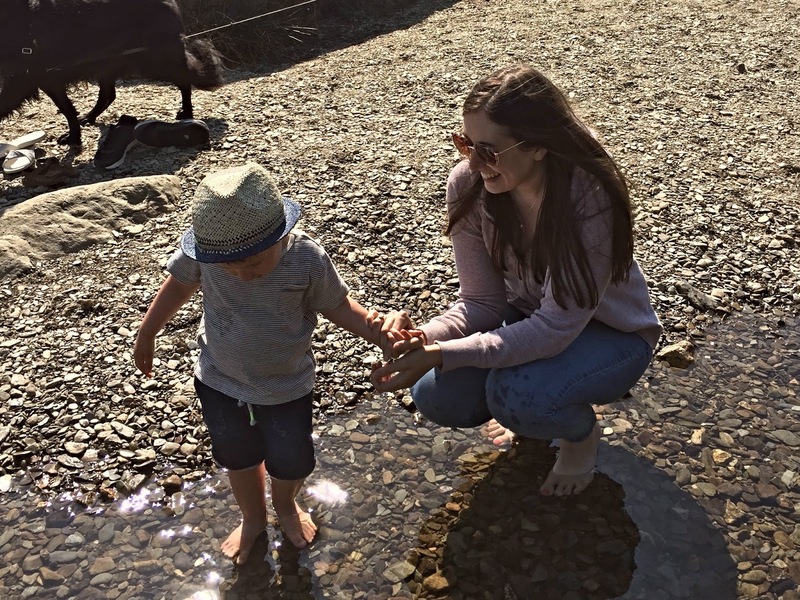 From a simple picnic in a local park to creating treasure hunts in a nearby woods, there are plenty of ways to keep your family entertained without spending a fortune. Whatever you choose, your family deserves something a little different to make Sunday a fun day! How do you spend your Sunday's? If you saw my recent Mum and Son Summer Fashion Wishlist, you'll know I ordered these gorgeous Next t-shirts for Arthur and I have to say, I think they're some of the best I've ever bought him. 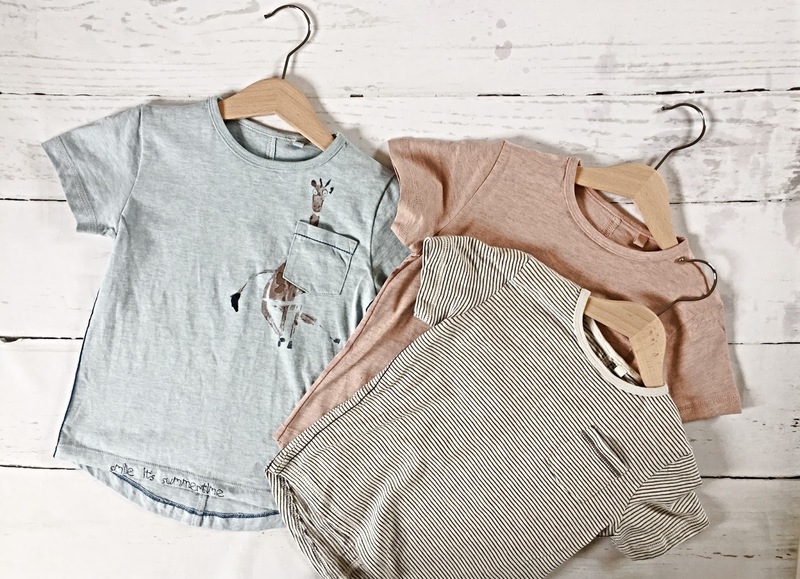 The colour palette of pale blue, blush and monochrome stripes is gorgeous; the giraffe is super cute and I love the addition of the little pocket on each shirt! Unfortunately it looks like most sizes have sold out but keep checking back, as when I was placing my order, it said 2-3 years was sold out one moment and then a few minutes later it was back in stock and I managed to nab a set! 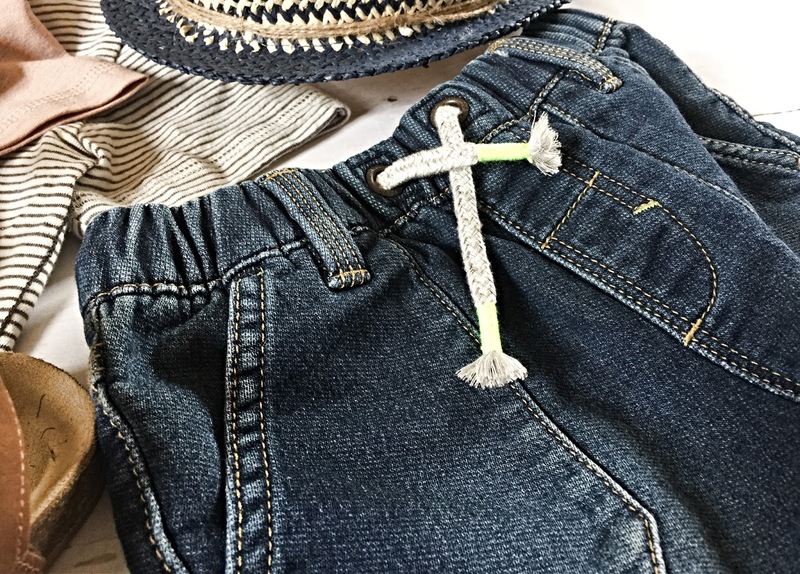 Next is one of my favourite places to shop for kids' clothing and although it's often a little more expensive than some of the supermarket fashion brands, to me it's worth it not only for the designs, which I love but the quality too. 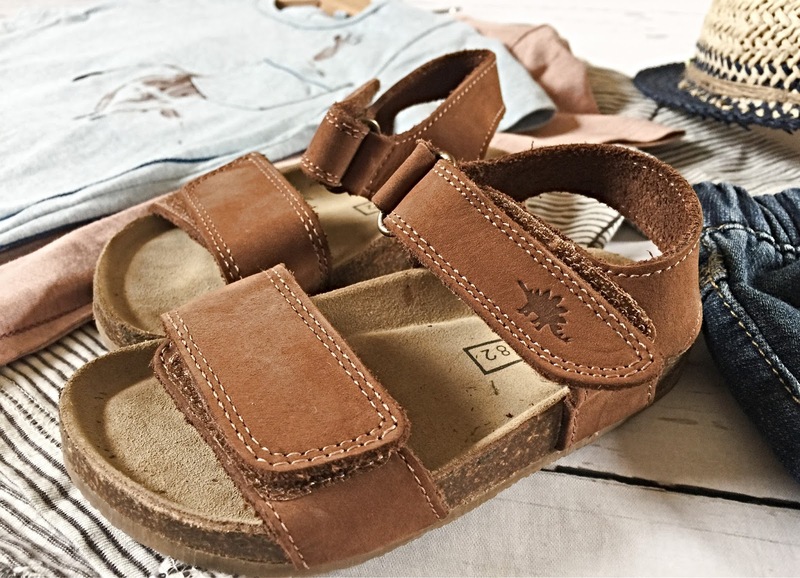 These smart leather corkbed sandals are from Next, as are the drawstring jersey denim shorts. Both items look super comfortable (Arthur seems happy in them) and I think they'll look great paired with the t-shirts above. I've actually ordered the light denim version of the shorts for him too! 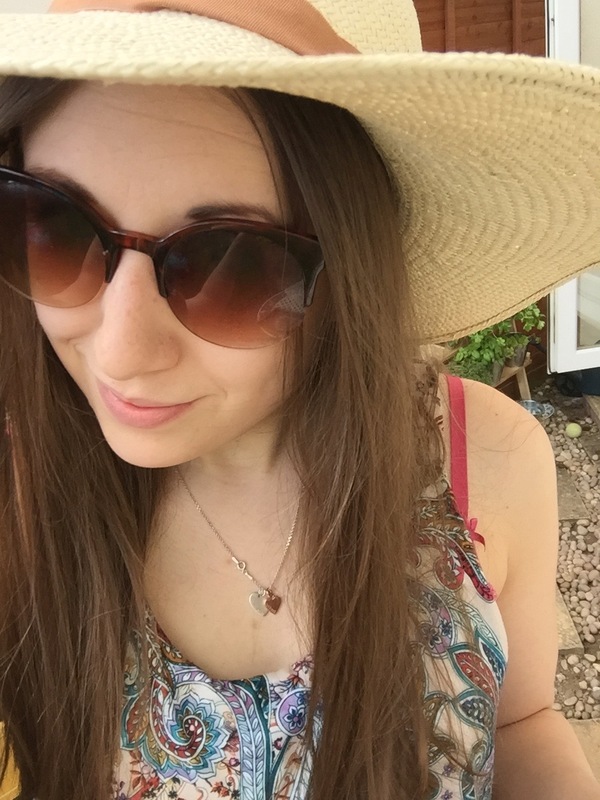 I love this little straw hat we picked up for Arthur from Tu at Sainsbury's. Not only does he look adorable in it but it will also help to protect his little head from the sun. My partner has a similar hat, which inspired the purchase. Twinning is winning right?! 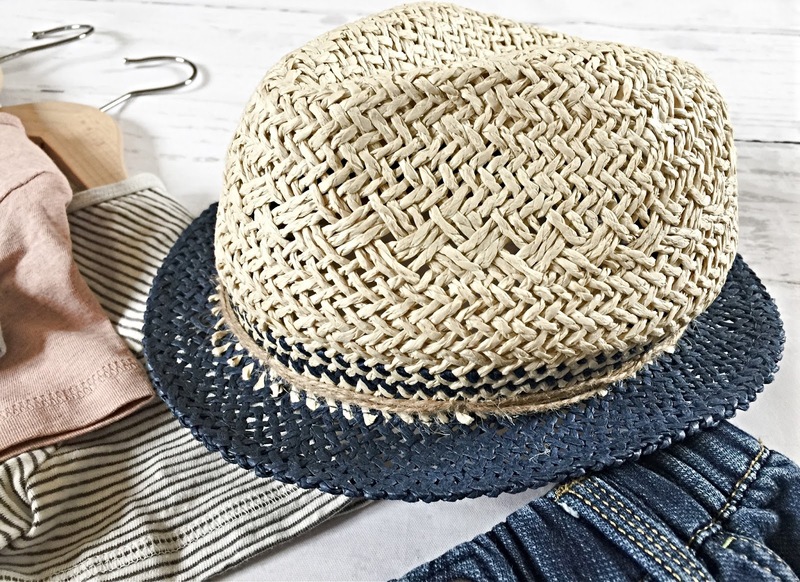 I'm so happy with all of these little additions to Arthur's summer wardrobe. He's at that stage where he actually likes to be able to choose what he wears and has an opinion on everything! Thankfully these seem to have got a thumbs up so far. 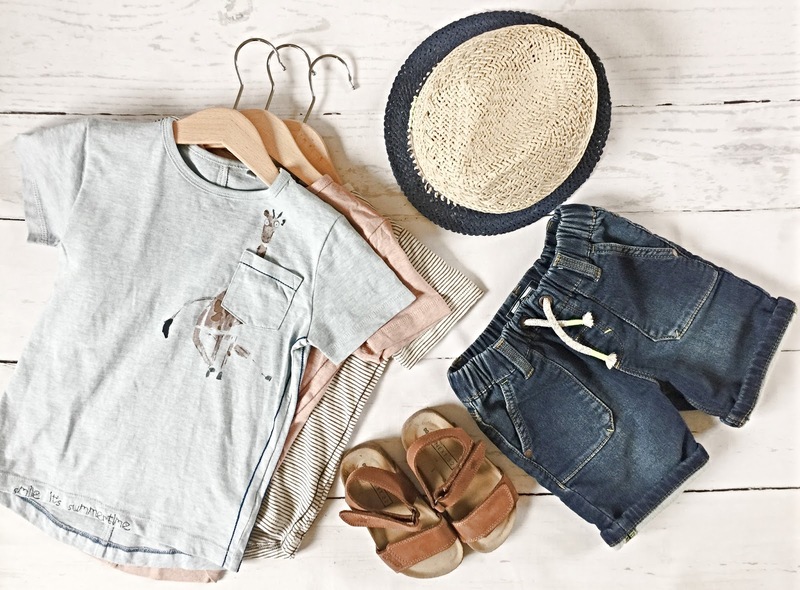 Where's your favourite place to buy kids' summer clothing? I woke up startled. There were noises coming from the drive, right outside my bedroom window and I immediately felt anxious. I looked over to my brother who slept soundly in the bed next to mine. Could he not hear the noises too? Maybe I'd misheard but it really felt like someone was on our driveway. I tried to go back to sleep but something niggled at my brain and told me I needed to go and tell my mum and dad. I crept into their room and woke them up. "I think there's someone outside our house," I told them. Dad peered out of their bedroom window but couldn't see anyone. It was the middle of the night and pitch black. I was convinced there was someone there, I'd heard them and the bedroom I shared with my brother (we were only small children) was right at the front of the house, next to the driveway, where my Dad's van was parked. I went back to bed, still with the feeling that something was wrong. The next morning, we were getting ready for our friends to arrive, when my Dad opened the backdoor and realised his van had been broken into. There was glass all over the drive where they'd smashed the back window (the noise I'd heard) and his tools were missing. Someone had, had the audacity to step onto our property, break into his van and steal the tools he'd worked so hard to buy. At the time I remember being really upset for him and scared that it was going to happen again. Something like that is really unnerving for anyone, let alone children. Now, as an adult it really angers me that criminals out there do this to people. They think it's okay to enter people's homes, to break into people's vehicles and to take stuff that does not belong to them. Do they not think about the effect it has on that person? Their family? Their finances and their well-being? Clearly they can't because surely, if they really thought about it, no one would do such a thing to another human being. But I guess, unfortunately, this is the world we live in and instead of dwelling on it, we have to instead take steps to avoid home break-ins and vehicle theft. In collaboration with DPP Law, I am sharing some of my tips to prevent burglary, robbery and theft. Click here to learn more about their specialist solicitors services. I see so many people on social media excitedly telling everyone about their upcoming holiday (or posting snaps while they're away) and I can't help but feel they're potentially putting their homes at risk of a break-in. It's all well and good if you've got someone house-sitting for you but if not, I'd be keeping this information to yourself. As great as it is to share your excitement, there'd be nothing worse than coming from your trip to find your house had been burgled, would there? If you're out of the house a lot, you may want to consider putting a timer on your lights or installing electronic blinds. You can program these to turn on and off and open and close at certain times, to make your home look more 'lived-in' during the day. This will help to create the illusion that someone is at home and even the most confident criminals aren't going to risk breaking into a home, in daylight, with someone potentially inside. We're often reminded in car parks to lock away or take expensive items like iPads, laptops and phones with us, when we've parked up but what about in our own homes? 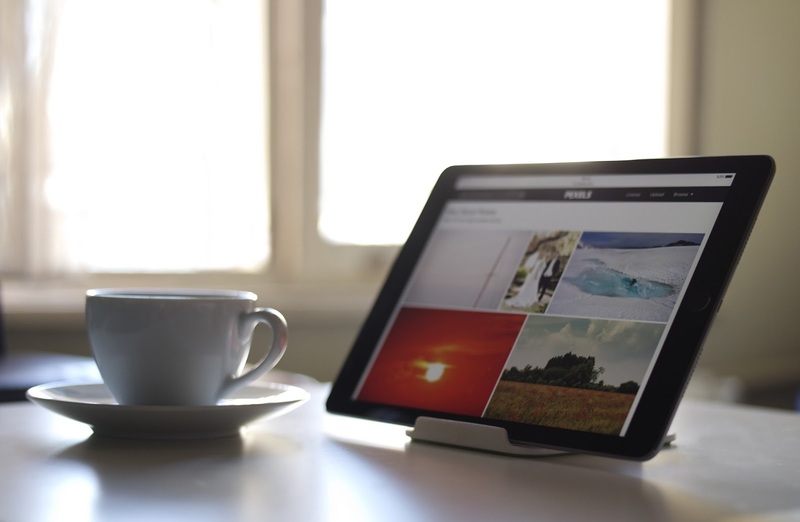 It's good practice to avoid leaving expensive items on window sills or out on display. Fencing your front garden and adding a lockable gate will also help to prevent people from being able to walk up to your house easily and peer through the windows. If you have a work vehicle, I highly recommend taking any tools or equipment out of it at the end of each day - especially after what happened to us! Locking them in your home or a garage is much more advisable. Sure, it can be a bit of a pain having to move them to and fro every morning and evening but at least they'll be harder for thieves to get to. 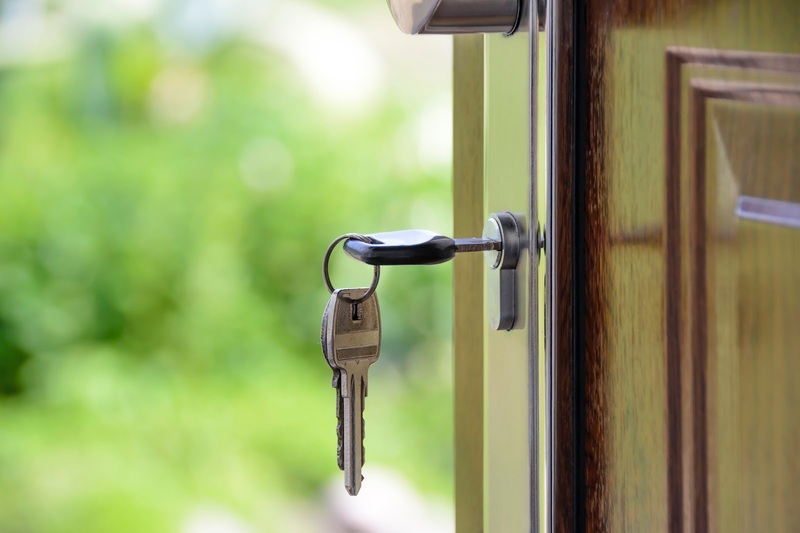 Locking your windows and doors (and double checking before you go out) may sound like an obvious one but it's something that I imagine people often forget in the summer time, when the weather's warmer and the windows are open. We're really good at keeping our windows locked (because of having a small child) but it's something that should be on everyone's minds before they leave the house. It's worth that extra 30 seconds to whizz round and check everything's secured. Obviously I would never suggest anyone goes out and buys a dog for security reasons. There is so much more to having a dog! But one of the great things about our four-legged-friends is that they tend to bark when people come to the door or they hear a noise. Our dog only has to see someone walk by and he'll have a bit of a bark! 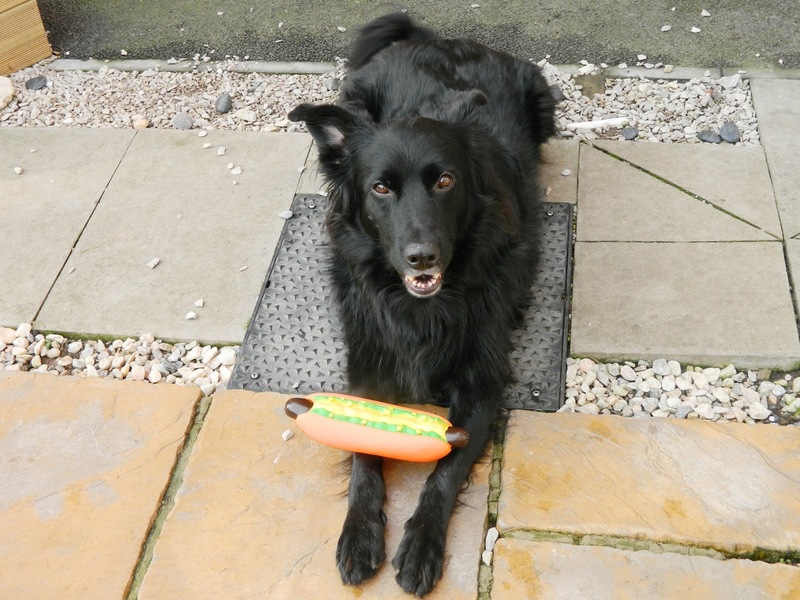 I feel a lot safer knowing he's here with us and that dogs (especially big ones like him) do tend to put off burglars. Has your home or vehicle ever been broken into? What tips would you add to help prevent burglary, robbery and theft?